A Wreath of Roses by Elizabeth Taylor ~ 1949. This edition: Penguin, 1984. Softcover. ISBN: 0-14-00.2587-1. 176 pages. My rating: Easily a 9/10 for the writing, perhaps a bit less for the dark mood it engenders. Well, no, I don’t really mean that. There are abundant gleams of light. As a middle-aged person myself, fast approaching the half century mark, much in this novel resonated with me, and I felt a strong sympathy and emotional kinship for all three of the female main characters, “maiden, woman, and crone”, as another reviewer referred to them. There are several excellent reviews on this early Elizabeth Taylor novel, only her fourth, which I’ve linked for your enjoyment below. Anything I have to say merely echoes what these others have said, so I won’t go into too much detail, or describe my response to this interesting novel except to say that I found it much more enthralling than expected. Frances, the eldest, owns the cottage where the three convene. A retired governess and a confirmed spinster, she has for years pursued a secondary career as a modestly successful painter. Liz, the youngest, was once Frances’ charge, and in the year past has married a much older clergyman and has borne a child, whose inclusion in the party is looked upon with something like apprehension by the adult trio. Camilla, a school secretary, is approaching middle-age; she too is a spinster, though not by choice; circumstances and her fastidious personality have left her out in the cold in the mating ritual, and her pride reinforces her smooth shell; she pretends not to mind her state, and the pretence is so finely wrought that she has begun to believe in it herself. It is Camilla who has the most outwardly eventful time. Her journey to the cottage has been horribly punctuated by a suicide at the railway station; shaken out of her usual reserve, she has made the acquaintance of a handsome young man who turns out to be going to the same village. Claiming to be a writer on a trip of nostalgic research, it is soon apparent that Richard is not averse to weaving a web of lies about his past and present. Camilla is attracted to him and he returns her interest, to the concern of Frances and especially Liz, who sense something “off” in Richard’s manner and constantly shifting explanations. All three of the friends are “paired up” as the summer progresses. Liz’s husband Arthur drops in from time to time, and Liz flits between her home and the cottage. Frances apprehensively prepares to meet a man who has been a long-time artistic patron and correspondent. Film director Morland Beddoes is himself uncertain as to whether the woman of his long-distance friendship will be the kindred spirit he yearns for. As the various personalities clash with each other, self-analyze and readjust, the truth about Richard slowly becomes revealed, with deeply disturbing repercussions. I must also add that Frances’ dog Hotchkiss is one of the most unpleasant canines I’ve yet met in literature. I suspect that Elizabeth Taylor was more of a cat person, as she uses feline comparisons in a rather favorable way in describing some of the characters, and incidentally gives a beautiful cameo appearance to a pregnant Siamese. 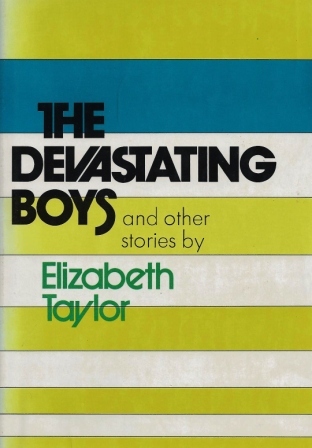 The Devastating Boys and Other Stories by Elizabeth Taylor ~ 1972. This edition: Viking Press, 1972. Hardcover. ISBN: 670-27067-9. 179 pages. My overall rating: 7.5/10. Competently and beautifully written, this is a quietly memorable collection of subdued short stories, written between 1965 and 1972. I’m not quite embracing the Jane Austen comparisons though, of which there are two from different reviewers on the dustjacket. Elizabeth Taylor. Hmm. As a broad statement, I very much like her work, but I don’t indiscriminately love it, with a few stellar exceptions. A mistress of concise, clean and crisply descriptive prose, I find I enjoy her voice the best when she lets herself go with keen, wry humour. The detail she picks up on is one of her best qualities. Thinking a little more about this author, I do think that perhaps her short stories are her best work. Like hyper-detailed miniatures they allow us to focus intensely for brief time on the minutiae which too often blurs in a larger, more ambitious narrative. Here’s what we have in this collection. I’ve included first paragraphs and a brief summary of each short story. Laura was always too early; and this was as bad as being late, her husband, who was always late himself, told her. She sat in her car in the empty railway-station approach, feeling very sick, from dread. It was half past eleven on a summer morning. The country station was almost spellbound in silence, and there was, to Laura, a dreadful sense of elf-absorption – in herself – in the stillness of the only porter standing on the platform, staring down the line: even – perhaps especially – in inanimate things; all were menacingly intent on being themselves, and separately themselves – the slanting shadow of railings across the platform, the glossiness of leaves, and the closed door of the office, looking more closed, she thought, than any door she had ever seen. She got out of the car and went into the station, and walked up and down the platform in panic. It was a beautiful morning. If only the children weren’t coming, then she could have enjoyed it. The children are two inner city six-year-olds, coming for a two-week country vacation to Laura and her university don husband. Nothing turns out as anticipated; the experiment refocuses Laura’s conception of her place in the world, and in her marriage. Unexpectedly upbeat ending. 8/10. “England was like this when I was a child,” Gwenda said. She was fifteen years older than Polly, and had had a brief, baby’s glimpse of the gay twenties – though, as an infant, could hardly have been really conscious of their charms. It was France – the middle of France – which so much resembled that unspoilt England. In the hedgerows grew all the wild-flowers that urbanization, ribbon-development, and sprayed insecticides had made delights of the past in the south of England where Gwenda and Polly lived. Polly had insisted on Gwenda’s stopping the car so that she could get out and add to her bunch a new blue flower that she was puzzling over. She climbed the bank to get a good specimen and stung her bare legs on some nettles. Gwenda sat in the car with her eyes closed. Gwenda acts as slightly simple, middle-aged Polly’s companion and guardian, and the trip to France is something of a journey into the past for Gwenda as the two retrace the course of Gwenda’s last journey with her late husband. An unexpected stopover in a French village gives Polly a chance to experiment with the pleasures of physical love, while Gwenda pursues her more sophisticated goals. The journey continues to its tragic (?) end. I quite liked this longish, rather rambling dual portrait. 7/10. This Sunday had begun well, by not having begun too early. Jasper Jones overslept – or, rather, slept later than usual, for there was nothing to get up for – and so had got for himself an hour’s remission from the Sunday sentence. It was after half past ten and he had escaped, for one thing, the clatter of the milk van, a noise which for some reason depressed him. But church bells had begun to toll – to him an even more dispiriting sound, though much worse in the evening. West Indian expatriate Jasper leads a starkly solitary life as a labourer in the “better” world of London. A poignant portrait of loneliness. 6/10. The sunlight came through dusty windows into Miss Smythe’s Gown Department on the first floor of the building. Across the glass were red-and-white notices announcing the clearance sale. It was an early summer’s evening, and the London rush hour at its worst. Rush hours were now over for Miss Smythe, and she listened to the hum of this one, feeling strange not to be stepping along the crowded pavement towards the Underground. In a corner of the department some of the juniors had begun to blow up balloons. The last customers had gone, and several of the office staff came in with trays of glasses. With remarkable deftness, as soon as the shop was closed – for the last time – they had draped and decorated Miss Smythe’s display counter, and they set the trays down on this. The great store, built in the 1860s, was due for demolition. As business slowly failed, like a tide on its way out, the value of the site had gone on growing. The building had lately seemed to be demolishing itself, or at least not hindering its happening. Its green dome still stood with acid clarity against the summer sky; but the stone walls had not been washed for many years and were black with grime and dashed by pigeons’ droppings. Fastidious, self-contained Miss Smythe prepares for her enforced retirement. 7/10. Kitty Miller, wearing a new red hair ribbon,bounced along the vicarage drive, skipping across ruts and jumping over puddles. Visiting took up all her mornings during the school holidays. From kitchen to kitchen round the village she made her progress, and this morning she felt drawn towards the vicarage. Quite sure of her welcome, she tapped on the back door..
“Why, Kitty Miller!” said the vicar, opening the door. He looked quite different from in church, Kitty thought. He was wearing an open-necked shirt and an old, darned cardigan. He held a tea towel to the door handle because his fingers were sticky. He and his wife were cutting up Seville oranges for marmalade, and there was a delicious, tangy smell about he kitchen. Kitty took off her coat, hung it on the usual peg, and fetched a knife from the drawer where they were kept. Kitty glanced at him rather warily. She preferred him not to be there, disliking men about her kitchens. She reached for an orange and, watching Mrs. Edwards for a moment out of the corners of her eyes, began to slice it up. Precocious young Kitty is something of a disturbing element in her village, sharing her “innocent” observations and reporting happenings from house to house, cleverly pinpointing secret weaknesses and touching sensibilities on the raw. Perfect twist in the ending. Good one! 9/10. Phyl was always one of the first to come into the hotel bar in the evenings for what she called her apéritif, and which, in reality, amounted to two hours’ steady drinking. After that, she had little appetite for dinner, a meal to which she was not used. On this evening she had put on one of her beaded tops, of the kind she wore behind the bar on Saturday evening in London, and patted back her tortoise-shell hair. She was massive and glittering and sunburnt – a wonderful sight, Stanley Barrett thought, as she came across the bar towards him. Middle-aged barmaid Phyllis has been sent on a solitary holiday by her husband to recover from a hysterectomy; she and widower Stanley inevitably draw together as kindred spirits among the more staid fellow members of their group tour to Malta. Taylor keeps just on the kind side of parody while painting a brutally honest picture of their brief “affair”. 8/10. Über-respectable Mrs. Mason’s skeleton in her closet is her long-ago cast-off sister, an author whose fanciful descriptions of their shared childhood brought writerly fame at the cost of familial shame. The young man in question brings up memories long buried, and casts Mrs. Mason into a state of panic. 6/10. The hallway, with its reception desk and hat-stand, was gloomy. Madame Bertail reached up to the board where the keys hung, took the one for Room Eight, and led the way upstairs.Her daughter picked up the heavier suitcase, and began to lurch lopsidedly across the hall with it until Leonard, blushing as he always (and understandably) did when he was obliged to speak French, insisted on taking it from her. Looking offended, she grabbed instead Melanie’s spanking-new wedding-present suitcase, and followed them grimly, as they followed Madame Bertail’s stiffly corseted back. Level with her shoulder-blades, the corsets stopped and the massive flesh moved gently with each step she took, as if it had a life of its own. A newlywed couple, nervous, impulsive Melanie and methodical, staid Leonard, are traumatized in their separate ways by an overheard argument in the room next door in their French honeymoon hotel. 6/10. Miss A. and Miss M.
A new motorway has made a different landscape of that part of England I loved as a child, cutting through meadows, spanning valleys, shaving off old gardens, and leaving houses perched on islands of confusion. Nothing is recognizable now: the guest-house has gone, with its croquet-lawn; the cherry orchard; and Miss Alliot’s and Miss Martin’s week-end cottage. I should think that little is left anywhere, except in my mind. Looking back to childhood summers forty years ago, the narrator paints telling portraits of the summer visitors she came to know, in particular two schoolteachers, sincere and quiet Miss M. and heedlessly vivacious, manipulative Miss A. Devastating. 9/10. On Wednesdays, after school, Sylvia took the bus to the outskirts of the nearest town for her music lesson. Because of her docile manner, she did not complain of the misery she suffered in Miss Harrison’s darkened parlour, sitting at the old-fashioned upright piano with its brass candlesticks and loose, yellowed keys. In the highest register there was not the faintest tinkle of a note, only the hollow sound of a key being banged down. Although that distant octave was out of her range, Sylvia sometimes pressed down one of its notes, listening mutely to Miss Harrison’s exasperated railings about her – Sylvia’s – lack of aptitude, or even concentration. The room was darkened in winter by a large fir-tree pressing against – in windy weather tapping against – the window, and in summer by holland blinds, half drawn to preserve the threadbare carpet. To add to all the other miseries, Sylvia had to peer shortsightedly at the music-book, her glance going up and down between it and the keyboard, losing her place, looking hunted, her lips pursed. I’m not going to tell you anything about this one, except that it’s a perfectly crafted little shocker. 10/10. Harry and Rose, returning to Mahmoud Souk, found it a great deal changed. Along the sea road there were neat beds of mesembryanthemum. There were lamp standards, too; branches of globes, in the Parisian manner. Four years before, there had been only a stretch of stony sand, a low sea wall, an unmade road. Now new buildings were glittering along the shore – a hospital, a cinema, a second hotel. A young couple returns to a memorable holiday destination of the past, expecting a happy, nostalgic visit with their pet “locals”; they find instead that you truly can never go back again. While beautifully written as always, I did think this was perhaps the weakest story of this collection. 6/10. 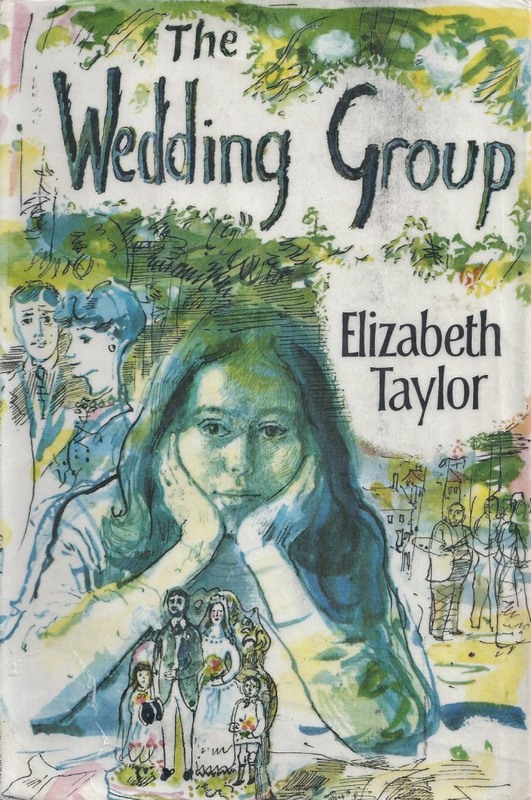 The Wedding Group by Elizabeth Taylor ~ 1968. This edition: Chatto and Windus, 1968. First Edition. Hardcover. 230 pages. My rating: 7.5/10. I know that Elizabeth Taylor (1912-1975) is something of a pet author among the book blogging crowd, but I find I sometimes have to try really hard to whole-heartedly like her style. I found the writing in this novel rather stilted and distant; I also found the story itself depressing, with the humour being on the subfusc side of the spectrum. Nineteen-year-old Cressida (Cressy) has lived all of her life in the exclusive artists’ colony presided over by her patriarchal maternal grandfather, Harry Bretton. 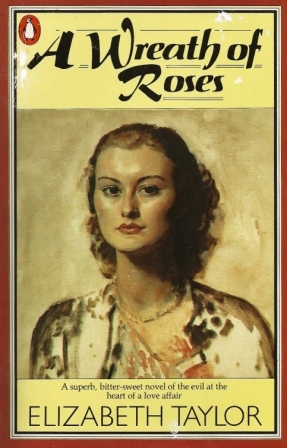 The only child of meek mother Rose, and ineffectual father Joe (an Irish would-be writer hand-picked by Harry as a suitably infuenceable husband for his daughter), Cressy yearns for a life outside of the earnestly dull extended-family enclave she is trapped in. Harry Bretton was once a outré artist whose depictions of Biblical scenes incorporating contemporary settings caused a certain stir. The art world has moved on, and such non-conventional depictions are now the norm, but Harry clings to his old style, supplementing his decreasing artistic income by forays into religious lecturing, as well as taking in well-heeled “disciples” eager to study at the feet of the “Master”, as he has self-styled himself. Cressy then finds herself a job doing menial chores at the village antique store, and, in a small sequence of coincidences, meets a middle-aged journalist who is a friend of the antique shop owners, as well as having previously written a sarcastic article regarding Harry Bretton’s establishment. David Little is modestly successful in his field, and, living with his divorced mother, has a comfortable enough life, though he has noticed that of late romantic relationships are becoming more and more unsatisfactory, as all the “good ones” – desirable women with looks, charm and pleasant personalities – are leaving the singles scene for the securities and domestic pleasures of marriage. David surprises himself by his attraction to childish Cressy’s innocent enjoyment of such worldly pleasures as television, hamburger bars and ready-made clothing, and soon the two are romantically involved, to the initial pleasure of David’s emotionally needy and manipulative mother Midge, who sees in Cressy an unthreatening solution to the long dreaded break-up of her mother-son domain. Cressy and David marry, and Midge turns her full attention to preserving the status quo by erasing Cressy’s already feeble self-will and ensuring the continued attendance of David at the maternal beck and call. Cressy’s pregnancy and subsequent incompetent attempts at motherhood eventually bring about a shift in the balance of power as Midge becomes infatuated with her new grandson, and David realizes that the only hope for himself and his marriage is a breaking away from his mother’s insinuating grasp. The ending is ambiguous and could be slanted either optimistically or the reverse; I chose to read into it a hopeful future for all involved, though this is in no way guaranteed by the author’s very hands-off approach. I felt that the characters were nothing like as fully developed as they could have been; Midge seems to be the only fully rounded person in the story, and might indeed be the main protagonist. Cressy and David came across as mere sketches, though there are glimpses into the depths of each of them; just enough to keep us on their side and hope for an improvement in their relationship and their personal lives. Cressy’s parents and cousins are, in general, sympathetically handled, but one of the most potentially interesting characters, Harry Bretton – the Master himself – is left as a mockable caricature. Elizabeth Taylor was a decidedly clever writer with a wry and morbidly humorous viewpoint, but by concentrating on the darker side of human nature she walks the edge of being just a shade too cynical for my personal present reading comfort.